If you've ever tried to fall asleep next to a snoring spouse, in a flat with noisy neighbours or in a hotel room with lots of ambient noise outside the window, you'll know how disheartening it can be. A lack of sleep is not ideal at best and has the potential to impact your long-term health at worst. So, what's a person to do when the source of the noise is beyond your control? Address the noise (if you can). First things first, see if you can get to the source. If your spouse snores, ask them to look into measures that will lessen their snoring; if your flatmate or next door neighbour is noisy, have the awkward chat; or see if the hotel can move you to a room that is located further away from the source of the ambient noise. Get a grip on your responses. If addressing the noise is not an option, the next best thing is to condition yourself to fall asleep despite it. This will require some practice but will stand you in good stead in the long run. Start by not focussing on the noise (getting irritated only amps up your nervous system even further); then distract yourself. Try deep breathing exercises, meditation, visualisation exercises or progressive muscle relaxation. Employ auditory distractions. Adding more sound to the mix may seem counterintuitive, but it actually works a charm for many people. You could try to play some classical music through noise-cancelling headphones, or use a white noise app on your phone. 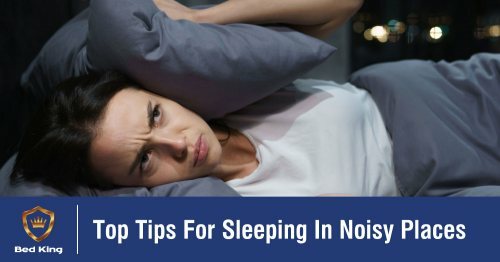 Alternatively, there is the option of investing in a white noise machine or a portable fan that could go some way to drowning out the worst of the noise. Get yourself super tired. If you’re exhausted when you get into bed, you are likely to fall asleep despite the noise. Schedule time for a workout throughout the day and make sure to get plenty of natural sunlight as well - it aids your circadian rhythm, which boosts melatonin production when it gets dark, signalling your body that it's time for rest. There you have it - a few things to try next time when you’re battling to sleep in a noisy place. Keep an eye on the blog in coming weeks and months for more insightful advice on ways in which you can make your sleep environment as calming and restful as possible. In the meantime, feel free to get in touch with a Bed King consultant to learn more about our comfort-graded sleeping surfaces, or come visit us in store to experience our patented Comfort Solutions Lab® to find the mattress that is the perfect fit for your unique pressure points.